The Wild Zoo Children’s Furniture Line CPU/Printer stand and/or side table, is made of the same materials and offered in the same surface and trim colors as all Wild Zoo desks. This stand provides a compact area for the printer and tower, freeing up desk top and shelf space. 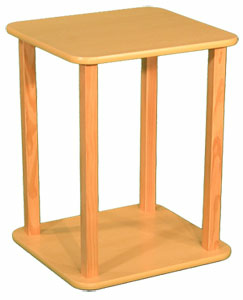 It can also serve as an attractive chair side or bedside table. Designed to compliment both the P/C and Buddy Desk, the stand is 23 inches high, with a surface area measuring 18.25 X 16.5 inches. It will accommodate a tower up to 21 inches tall.